Give them the gift of Disney with this wonderful silver plated first tooth and curl set. Featuring A.A Milne's charming Winnie the Pooh, Tigger and Piglet characters, these adorable christening gift boxes are silver plated for a luxurious finish. A stunning Disney set that would make a truly wonderful christening gift for that special occasion. 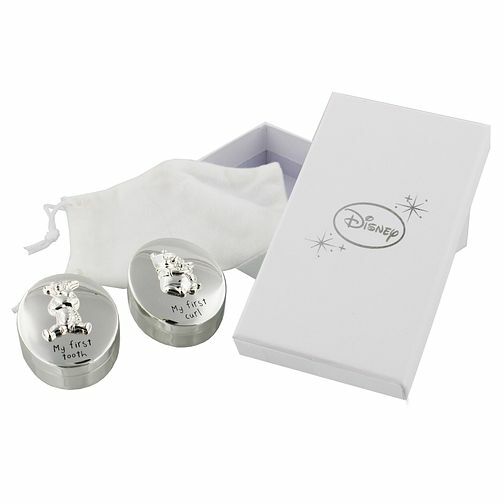 Disney Christening Silver Plated Pooh Bear Tooth & Curl Set is rated 5.0 out of 5 by 4. Rated 5 out of 5 by Anonymous from This was the perfect gift for my Grandaughters Christening It is absolutely beautiful and arrived very quickly. This was the perfect gift for my Grandaughters Christening It is absolutely beautiful and arrived very quickly. Rated 5 out of 5 by Anonymous from Perfect Present Online order arrived quickly. The packaging and quality of the product is very good. Lovely present for baptism.